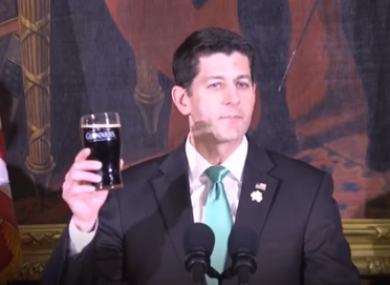 House Speaker Paul Ryan has traced his ancestry back to 19th-century Ireland. Ryan's decision not to seek reelection in Congress has come as a surprise. AFTER DEALING A blow to Republicans by announcing that he will not seek reelection, House Speaker Paul Ryan has now said that he would like to serve as the ambassador to Ireland in the future. Leaving the political world reeling yesterday by claiming that he will retire rather than seek another term in Congress, Ryan stated that he would be ending his 20-year political career to spend more time with his family. I wouldn’t mind being ambassador to Ireland in my 60s. Ryan, 48, who represents Wisconsin, claimed that he would not run for president in the future. Ryan claims Irish roots, having traced his ancestors back to Ireland during the Famine. He keeps a Kilkenny jersey and a hurling stick in his office, which were presented to him by the Irish Lobby for Immigration Reform after he spoke at once of their breakfasts. Here, he referenced his ancestor’s journey across the Atlantic in 1851. Perhaps his most famous ‘Irish’ moment was last year’s St Patrick’s day, when he toasted the Irish with what many online commenters derided as a poor-quality pint of Guinness. Under Donald Trump’s presidency, the post of US ambassador to Ireland has been left vacant in a move that’s characteristic of a White House that has left numerous key roles empty and is considered to have the slowest transition period for a new president in decades. When Ryan took the job of House Speaker in 2015, he became the youngest speaker in more than 100 years. He was the Republican Party nominee for Vice President of the US in the 2012 presidential election, running alongside former Massachusetts governor Mitt Romney. Once considered one of the Republican Party’s biggest stars, his surprising departure has signaled trouble for the Republican party under Trump as its candidates continue to lose elections to Democrats, even in traditionally conservative states. Email “Paul Ryan: 'I wouldn’t mind being ambassador to Ireland in my 60s'”. Feedback on “Paul Ryan: 'I wouldn’t mind being ambassador to Ireland in my 60s'”.